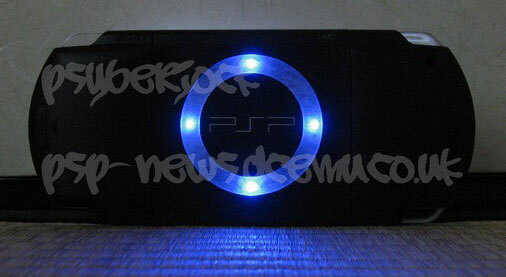 Just the thing to go with our shiny PlayStation 3, this "ring of light" PSP took over 30 hours over three days to make. And that's for an experienced modder. That being said, I probably won't make a how-to. Considering the difficulty level of this mod, if you can't figure it out yourself, you'll probably just break your PSP or UMD tray. I used to mod my dreamcast and xbox, and this is by far the hardest thing I've done so far. If I get a lot of requests, I'll describe it and maybe make some graphics, but I doubt I'll take the PSP apart again for fear of having to solder some things again. The UMD works, and has all the functionality of the original. Except this one's shinier. Wonder if there's a way to turn the lights off?